Dice bacon and add to hot pan, cooking until slightly crisp. Remove with a slotted spoon and reserve. Add peas and a sprinkle of salt to the pan and cook in the bacon fat until tender (about 8 minutes) adding garlic and orange zest in the last 2 minutes of cooking. Mix in cooked bacon, then remove mixture from pan and set aside, covered to keep warm. Add rendered pork fat/coconut oil to pan. Bring to medium high heat. Sprinkle scallops with salt, pepper, and paprika and add to hot pan, working in two batches if needed (don’t overcrowd them in the pan). 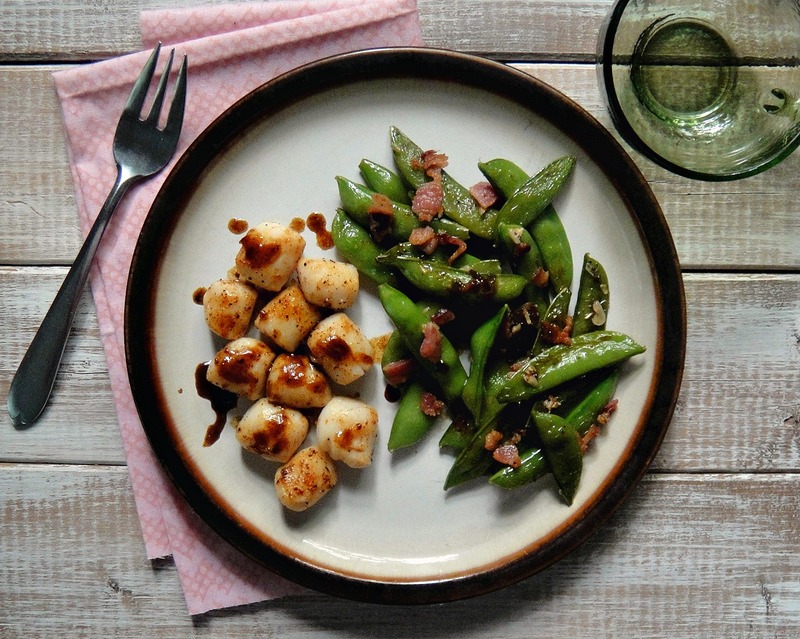 Cook for 1-2 minutes per side, being careful not to overcook scallops. They are done when they turn from translucent to milky white. Remove from pan and cover to keep warm. Add orange juice, balsalmic vinegar, salt, pepper, and chili powder to pan. Stir and reduce until you achieve a thick sauce (you can add a few chili flakes if you like it spicy). 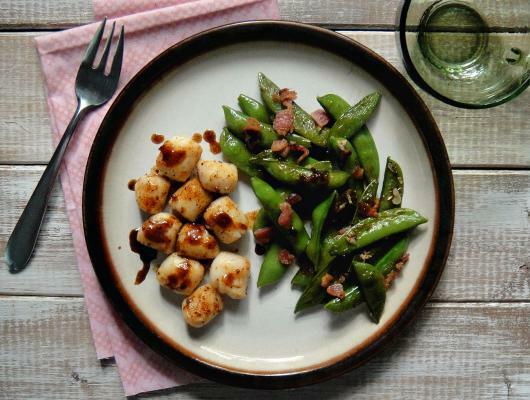 Drizzle over peas and scallops and dive in!